Let's go to another beach for a change. 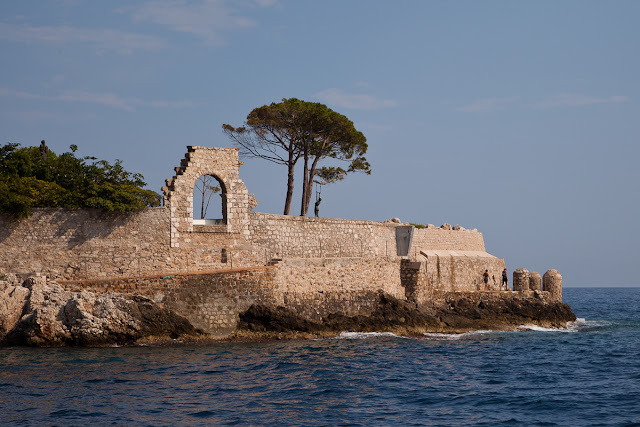 Today, we are just along the coast at Cap d'Ail. In fact Cap d'Ail adjoins Monaco so really it's no distance. We're on a boat and we've rounded the headland, Cap Mala. This leads into the beautiful bay of Plage Mala. Looking at this photo, Monaco is off to our left. There's a beautiful coastal footpath and you can see people walking on it. You can also see someone hanging from a tree! And note those big fat pillars at the point of the headland. This is part of a famous villa 'Les Roches' which we'll see another day. Looks beautiful. The sea has a special blue in the Med. So beautiful, would love to be there now with my swimsuit. Please do tell us more about the villa on the cape; I've always liked it! I heard it's a swedish businessman owning it? What can you tell us about the big empty rock a few hundered meters west of the Cape Mala? Has it ever been built? Christian, I've only just got your commentary. Found two in the Spam file. So sorry. I'm going to be doing this coastal walk and will endeavour to answer your question at some point - it won't be immediate. Apologies for delay.